Artemisia has a colorful and rather dubious history: Artemisia was the wife and sister (yes, that is correct) of the Greek/Persian King Mausolous from which we get the word mausoleum. The genus artemisia was named after her and includes over 400 plants. Artemisia was a botanist and medical researcher. Many of the artemisia varieties have insecticidal properties with wormwood being the most potent. Roman wormwood is less toxic and is used to flavor the drinks Vermouth and Campari. A sachet made of wormwood leaves will keep moths at bay. Did you know that the delectable herb tarragon is of the artemisia genus? Wormwood, Artemisia Absinthium has been used for centuries as a moth repellant, general pesticide and as a tea/spray to repel slugs and snails. Before its' toxicity was known it was used as the name implies: a worming medicine for people and animals. . Historic references to wormwood go back as far as 1600 B.C. in Egypt. Wormwood leaves contain absinthin a substance which can be toxic to other plants. You may have heard of the alcoholic drink "absinthe" a green colored beverage that is now illegal in most countries. And rightfully so as it has been said that the painter Vincent van Gogh was imbibing of absinthe when he lopped off his ear to send to a woman. The absinthin being water soluble will wash off the leaves and leach into the soil interfering and stunting the growth of plants in close proximity to the wormwood. Because of this do not use wormwood tea as a spray on small plants or seedlings, only on more established plants. We offer only our own experience in using wormwood tea as an insect spray and suggest that you use it with caution until you see how it works for you. For best results spray directly on the target insects or use dried wormwood cuttings spread on the soil in the garden. 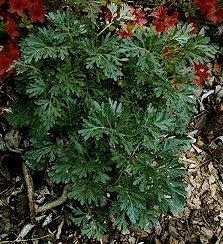 Don't use wormwood tea on edible plants, use only on ornamental plants. Dried worm wood sprigs may be used in the garden as a scent deterrent. Wormwoods are toxic so must not be ingested. A hardy perennial, almost shrubby, growing up to 4 feet tall, its spreading branches covered with white, silky hairs. The leaves are much-divided and have an intense, persistent bitter flavor. The flower heads are greenish or yellow, 1/8 inch wide, and very numerous. Its seeds are grayish and very small. Native to Europe and sometimes as an escape in North America. What is Wormwood (artermisia absinthium)? Wormwood (artermisia absinthium) is a herb that has psychoactive and hallucinogenic properties. Wormwood is said to affect the neuro receptors in the brain in a similar way to THC (the psychoactive component present in cannabis). Most absinths available will say that they include wormwood. We at Sebor have had a lot of absinth brands tested, the majority of the ones we have tested do not have any wormwood at all; the highest containing 3mg per litre - just 1/3rd of the amount that is in Sebor Absinth. The Sebor Absinth sold on this site has a minimum of 9mg per litre. There is no Absinth brand available with more wormwood than Sebor Absinth. Wormwood (absinthium artimesium) is a shrub like perrenial belonging to the great family of compositae, which are native to Europe and Asia. It is a long lived, tenacious plant, two to four feet high with grayish green leaves. The flowers have greenish - yellow tint, have no pappus, and like the leaves, give off a strong aromatic odour and are bitter to taste. Wormwood is supposed to have grown up along the path by which the serpent took exile from the Garden of Eden. In some parts of Europe, wormwood is called 'Girdle of St. John' and is believed to ward off evil spirits. By a strange coincidence wormwood in Russian is 'Chenoble', the name of the Russia city which experienced a nuclear melt down in 1986. (Pro 5:4) But her end is bitter as wormwood, sharp as a twoedged sword. (Jer 9:15) Therefore thus saith the LORD of hosts, the God of Israel; Behold, I will feed them, even this people, with wormwood, and give them water of gall to drink. (Jer 23:15) Therefore thus saith the LORD of hosts concerning the prophets; Behold, I will feed them with wormwood, and make them drink the water of gall: for from the prophets of Jerusalem is profaneness gone forth into all the land. (Lam 3:15-19) He hath filled me with bitterness, he hath made me drunken with wormwood. He hath also broken my teeth with gravel stones, he hath covered me with ashes. And thou hast removed my soul far off from peace: I forgat prosperity. And I said, My strength and my hope is perished from the LORD:  Remembering mine affliction and my misery, the wormwood and the gall. (Rev 8:11) And the name of the star is called Wormwood: and the third part of the waters became wormwood; and many men died of the waters, because they were made bitter.